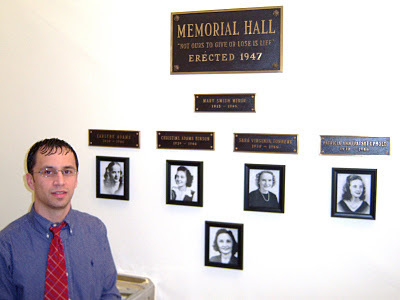 A crowd of seventy people filled Memorial Hall in Thomaston, Georgia to re-dedicate the plaques honoring the Youth Assembly delegates and their faculty advisor who perished in the Winecoff Hotel fire. Friends, family and classmates of Mary Minor, Earlene Adamas, Patsy Uphold, Christy Hinson and Virginia Torbert were among those who gathered to remember the five young women, who when faced with certain death, showed uncommon faith and courage. Firefighters found evidence of panic throughout the hotel. But not in room 1430. There they found this Bible on the bedside table, opened to this page containing the verse: "Let Not Your Heart Be Troubled..." Beside the Bible, the five suffocation victims lay peacefully, side by side, on a double bed. Reverend Edwin L. Cliburn addressed the crowd calling the Winecoff fire a "defining moment" for Thomaston. He called it, "a time of supreme sorrow." But one that inspired a spiritual rebirth that eventually "had a good wholesome impact" on the city. Thomaston-Upson Couny Archivist Claude Burgess stands beside the newly re-dedicated plaques. He often fields questions about the Winecoff fire. The re-dedication was organized by Donna Auth. The Thomaston Times' front page coverage is here. Also see: Thomaston Girls Remembered.